Jazz singer Katherine Davis, of Chicago (far right, with microphone in hand) and patrons dance on stage at RedBones the Blues Café. Caption: Everybaddy now!....Cent! FyCent!...TenCent.... Dalla Come again.....Cent....!! Caption: Jazz singer Katherine Davis, of Chicago (far right, with microphone in hand) instructs some youngsters on how to perform the \"Ketchup Song\" dance at RedBones the Blues Café. 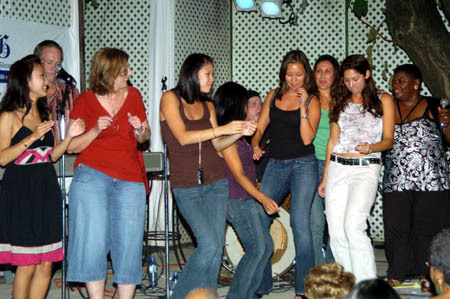 Caption:DJ Whitey Cool leading this group of hot girls doing the latest dances \"Swing it Weh\" & \"Tek Weh Youself\". Caption: The \"tek weh yuself\" dance contest on stage seemed lifeless, until the old cast of the \'Facts of Life\' showed up. Caption: Jazz singer to ladies: Come on ladies, this is Jamaica, do the butterfly, not a Hawaiian dance! Caption: COME ON NOW LADIES, GIVE IT YOUR BEST SHOT, REMEMBER THE WINNER GETS TO TAKE THE CROWN THAT BOGLE LEFT. WACKY DIP NOW! WACKY DIP! Caption: Miss Jamaica Pageant Coach, far right, attempts to explain to losers in the Miss Jamaica Look Alike Competition the other than obvious reason they were not succesful in their attempt.